After searching for a few hours on the web, I’ve been able to get my R code working and plot breast cancer data on a world map. It might not the best looking map possible (R graphics is incredible! ), but I am happy with that for now. 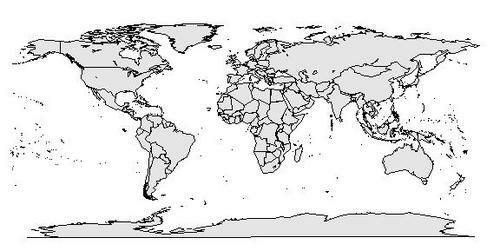 All right, now I have two new columns in my data set, indicating lat and long coordinates for each country :) Cool, next step is finally drawing a map with the data. I am sure we can do prettier plots with R (I know there are other interesting packages suitable for this, such as ggplot), but I am happy for now. I’ve learned something new and been able to visualize and communicate data in a more effective way than just a scatterplot. 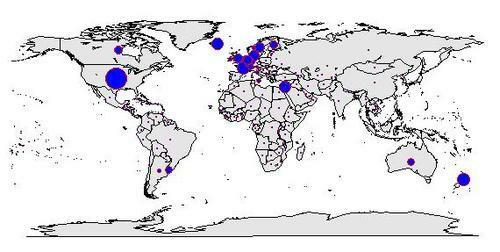 Looking at the map, we can quickly identify the countries/areas with the highest number of breast cancer cases and hypothesize patterns. As reported on my last post, these are United States, New Zealand, Israel, Central/Northern Europe and in general highly developed economies rather than developing countries.